Two new hotels with a combined 2,800 guest rooms are on their way to Universal Orlando Resort – with rooms starting at less than $100 per night. The new hotels will be built on the former site of Wet ‘n Wild and its parking lot, at the intersection of Universal Blvd. and International Drive. The new hotels have not yet been named, but will feature a laid-back coastal feel and beachy theme. Guests will receive on-site benefits like early park entry and free transportation to the theme parks and CityWalk. See below for full details on these two new hotels and stay tuned for more theme park news. Universal Orlando Resort will soon offer two high-quality, high-value hotel options for families looking for theme park thrills, exclusive benefits and a seamless Universal Orlando Resort experience – starting at less than $100 per night. Set to begin opening in the summer of 2019, the hotels will feature a combined 2,800 guest rooms, including 1,450 two-bedroom suites designed to accommodate families of all sizes. Both options will be value-driven, with nightly rates starting below Universal’s Cabana Bay Beach Resort and Universal’s Aventura Hotel. Guests will enjoy a seamless and convenient Universal Orlando experience with Early Park Admission to Universal Studios Florida, Universal’s Islands of Adventure or Universal’s Volcano Bay, complimentary transportation across the destination and resort-wide charging privileges. 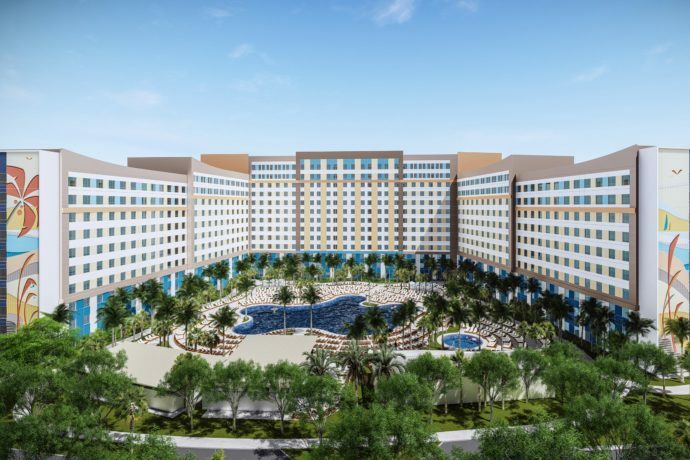 The 750-room and 2,050-room hotels will be located just minutes away from Universal Orlando’s three theme parks and Universal CityWalk’s dining and entertainment options. Amenities will include a combined three pools, two food courts offering breakfast, lunch, dinner and nearby coffee bars, plus poolside bars, fitness rooms, car rental facilities and more. 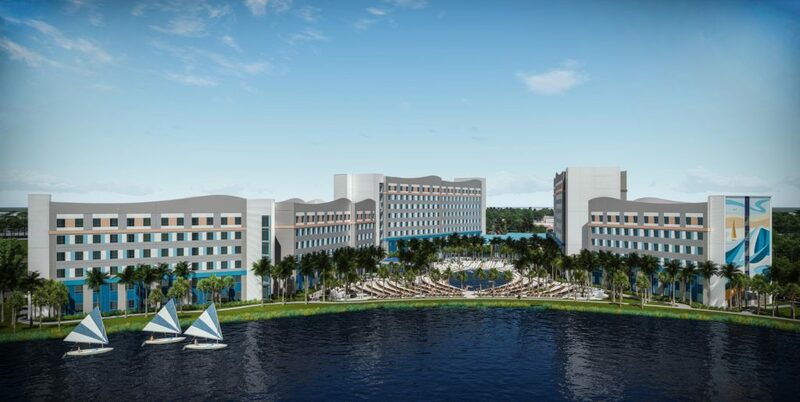 Brought to life by the same Universal Creative team behind the incredibly-themed Loews Portofino Bay Hotel, Hard Rock Hotel, Loews Royal Pacific Resort, Loews Sapphire Falls Resort and Universal’s Cabana Bay Beach Resort, these all-new options will be destinations unto themselves. Guests will enjoy the sun, surf and sand with a laid-back coastal feel. Towering exterior murals with vibrant and natural colors will set a free-spirited and beachy tone, inviting guests to hang loose throughout their stay. The hotels will be built on a 64-acre site at the intersection of Universal Blvd. and International Drive, and become the destination’s seventh and eighth hotels. This continues the unprecedented growth ongoing at Universal Orlando Resort. The new hotels will bring the total number of guest rooms at the destination to 9,000 when combined with the 600-room Universal’s Aventura Hotel opening in August 2018. Reservations will be accepted in early 2018.